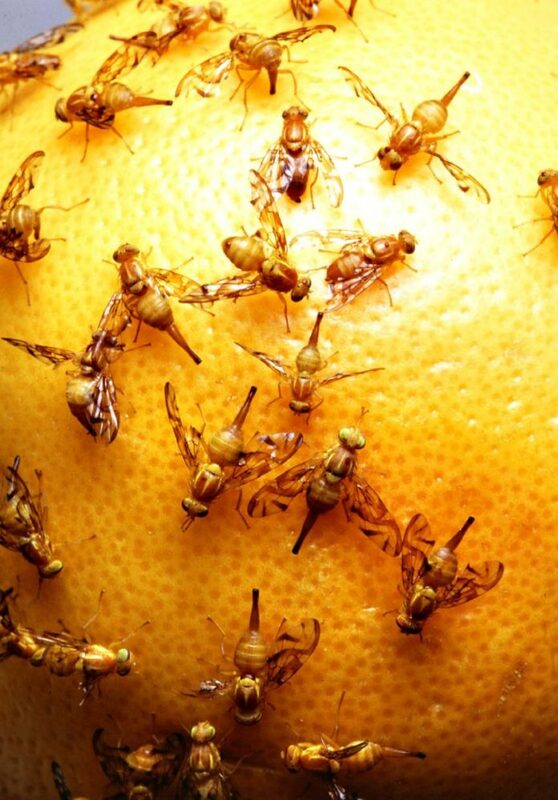 Mexican fruit flies swarm an orange. HARLINGEN — Certainly one of the joys of living in the Rio Grande Valley is walking into your backyard and plucking a fresh orange or lemon from a tree. While citrus is a major Texas industry, and the climate is conducive to easily growing these fruits, commercial citrus growers are asking homeowners with these trees to help them in their decades-long war with the Mexican fruit fly. “This time of year, like every year, the Mexican fruit fly is an issue in the Rio Grande Valley,” Eleisha Ensign, public relations director for Texas Citrus Mutual, said. “The message for homeowners, and this is a big problem for homeowners, is we need the fruit off the tree. Texas Citrus Mutual has picked April 1 as a deadline for homeowners to pull all backyard fruit off the trees, either to eat or destroy. Ensign said there’s not anything special about April Fool’s Day when it comes to setting the deadline; it’s just the date dovetails nicely with the end of the commercial growing season. The citrus industry recommends if fruit isn’t going to be consumed, or is too far gone to consume, that homeowners knock it off their trees and use a shovel or other implement to pierce the skin of the fruit. The Mexican fruit fly is particular about laying eggs in an orange, lemon or any of three dozen other Valley fruit trees, and won’t touch anything but an intact piece of fruit. “So if you’re wanting to utilize it like fertilizer and let it decay and rot and go into the soil, that’s fine, but the fruit needs to be cut up,” Ensign said. If composting the fruit isn’t an option, Ensign urges homeowners to place the fruit in a trash bag and dispose of it in a garbage can or trash receptacle to be taken away. The Texas citrus industry ranks third in the nation with about 250,000 tons produced annually, putting it behind California (3.9 million) and Florida (3.5 million) but ahead of Arizona (66,000). That amounted to $87 million for Texas growers last year. In Texas and elsewhere, the Mexican fruit fly is unfortunately no stranger, and has posed a threat for 80 years. The state has gone in and out of quarantines whenever the pest shows up and departs. “The Mexican fruit fly does affect our industry because if a fruit fly is found, of course a quarantine goes into place, and if we’re still shipping fruit during that time or that fruit is still on the tree, it becomes an issue for the growers who have fruit in that area,” Ensign said. Texas citrus growers are particularly concerned with a fruit variety most people don’t even know they have. Many fruit-bearing citrus trees such as grapefruit and oranges are actually grafted onto sour orange rootstock, although some sour orange trees are planted decoratively. But if the top of the trees, the grafted branches, are damaged or stop producing, Nature finds a way and sour oranges blossom and begin to grow on the lower branches. It transforms into a sour orange tree. “A lot of people have that happen, and they say ‘Oh, look I have an orange tree’ and all of a sudden, find they’re sour,” Ensign said. “There are a lot of sour orange trees out in the Valley and nobody would pick those and eat them.